Stories New Berlin Animal Hospital Pet Examination services. Takes more than a high speed chase into our sign to close our doors! Don’t worry, we are open for business as usual. Thank you to our New Berlin Police Department and the K-9 Unit for their hard work. Just like the human flu virus, the dog flu is an airborne virus that is spread by coughing and sneezing via aerosolized respiratory secretions. The virus may spread through contaminated objects (kennel surfaces, food and water bowls, collars, leashes, etc.) and people moving between infected and uninfected dogs. It is not spread via urine or feces. The virus can remain alive and able to infect surfaces for up to 48 hours, on clothing for 24 hours, and on hands for 12 hours. It is easily killed by commonly used disinfectants – bleach, ammonia, even ordinary hand soap. Dogs are infected with the virus for 2 – 4 days before the start of symptoms. They are actually the most contagious during the time, before they are exhibiting signs of illness. Contagiousness decreases dramatically during the first 4 days of illness but may continue up to 7 days in most dogs and, rarely, up to 10 days in a few dogs. It is highly contagious from dog to dog but rarely fatal. Symptoms include: fever (usually low grade), cough, nasal discharge, sneezing, ocular discharge, lethargy and anorexia. More severely affected dogs can exhibit a high fever with an increased respiratory rate and other signs of pneumonia or bronchopneumonia (usually from secondary bacterial or mycoplasmal infections). To protect your dog from the dog flu, keep your dog away from high-risk areas that include dog parks, kennels, doggy day care, grooming, training facilities and pet stores. Avoid popular walking areas for dogs as well. A vaccine is available for the “traditional” canine flu, H3N8; however, the recent outbreak is from Asia, H3N2, which the vaccine is not effective. If you are interested in vaccinating your dog, a series of two vaccines given 3 to 4 weeks apart and then once a year thereafter is necessary. Protection does not reach its maximum until up to 7 days after the second booster. Although the vaccine can be helpful, pets can still get the canine flu even if vaccinated but the severity of the disease may be reduced. We were voted #1 for “Best Veterinarians” on WISN A-List for 2014! Itchy skin either generalized or in a specific area of the body such as the eyes, ears or face. Bacterial skin infections or rashes either generalized or located in a specific area called “hot spots”. Chewing or nibbling on the top of the legs or paws. Excessive licking of the paws. Excessive ear wax production or ear infections. Rubbing of the muzzle on the floor. Less frequently, sneezing or watery eyes. These signs can be caused by many types of diseases, but these are the more common signs displayed by pets with allergies. Like in humans, allergies can be triggered by many things including inhalant (airborne), topical (contact with the skin), and/or food allergies. How the body reacts to these allergies can be multifactorial making it difficult to treat or manage allergies by a single solution. To better understand why a multimodal approach to managing allergies is necessary, let’s look at what happens in the body when an allergy is triggered. Inhalant Allergen → multi-step process involving T-Lymphocytes, B-cells and the release of IgE → release of histamines and other inflammatory chemical mediators such as cytokines, interleukins, leukotrienes and prostaglandins → dilation of blood vessels (red skin), mucous secretions including ear wax and oils on the skin, nerve stimulation (itching, biting and chewing of the skin), and smooth muscle contraction. Contact Allergen → multi-step process that is different than the inhalant allergen that involves T-cells that destroy target cells and activates macrophages and the release of hydrolytic enzymes → physical signs similar to the inhalant allergen. Sometimes issues with the internal organs and/or endocrine systems can affect the skin making the skin more sensitive to topical irritation. Food Allergen → depending upon the type of reaction with the protein in the food, the process may follow different pathways → abdominal pain, bloating, vomiting, and/or diarrhea may be the result. The success or failure of the treatments attempted depend upon what the cause(s) of the allergy is (are). So what are the causes of allergies? Home furnishings including fibers, dyes, plastic products, polishes, cleansers, cement, etc. Internal parasites including intestinal parasites, heartworm, etc. Skin scrapings – looking for mites, bacteria, fungal infections, etc. Skin impression smears – looking for infections, etc. Immunotherapy – in the form of allergy shots or oral liquid. Food trials – there are no diagnostic tests for food allergies, so this option is performed by trial and error and can take many months to determine what foods your pet may be allergic to. In the past, when pets would not respond to more basic approaches to allergy treatment, veterinarians have had to use steroids to help suppress the many reactions described above. Steroids have proved to be very effective in allergy management but the side-effects of steroids have been less than desirable. There is hope however with a new medication called Apoquel. Apoquel works at the level of the release of cytokines, the initial trigger for inflamed and itchy skin. Apoquel is a new type of drug, not a steroid, which quickly and significantly reduces the effects of the allergy reaction in our pets. Apoquel can be used while other tests are performed to determine the cause of the allergies. Apoquel can be used with other medications such as antihistamines or non-steroidal inflammatory drugs (Rimadyl, etc.). Apoquel does have some restrictions of use such as it cannot be used with steroids, dogs under one year of age, or pets with certain health conditions. Apoquel is only approved in dogs. Apoquel is proving to be a very important component in the management of allergies and is showing great promise in the future. Unfortunately, because it is a new medication, it is only available for a limited number of patients at this time. We hope that it will be available on a much larger scale by the end of the year. For more information on allergies, the management of allergies and/or Apoquel, please consult your veterinarian. Microchip – Have your pet microchipped. The summer months have the highest incidence of lost pets. Having your pet microchipped helps to ensure that when your pet is found, he or she will be returned to you. 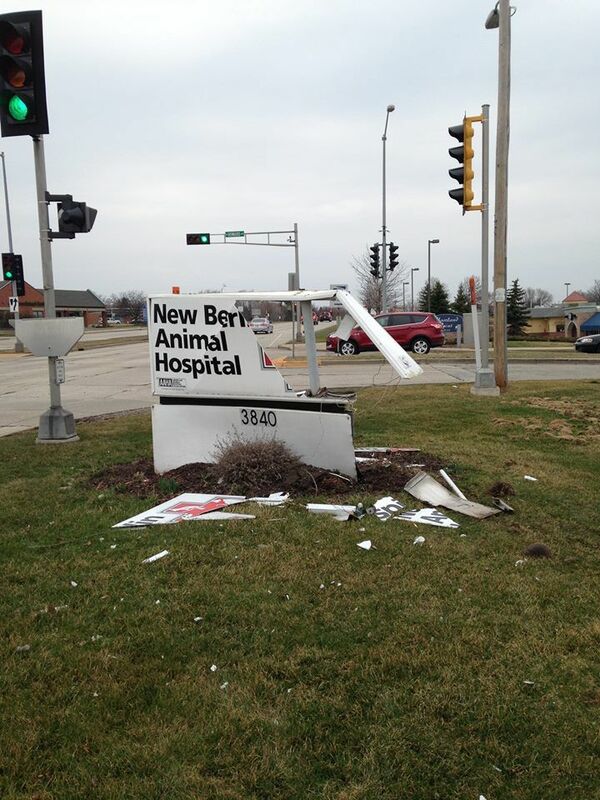 At New Berlin Animal Hospital, we can microchip your pet while you wait. Also, if your pet is microchipped, make sure you have the number registered with your current name and address. Contact the manufacturer of your pet’s microchip or give our office a call and we can help. Many but not all hotels and motels accept pets. Call the places that you will stay and make sure that they accept pets. When traveling in a car, bring plenty of water along. Pets get thirsty especially if they are laying on the seat on the sunny side of the car. If your pet gets car sick, call our office for information about medications that can be dispensed to help with car sickness. Flea and Heartworm protection is critical when traveling with dogs and cats (if the cats will be outside). Make sure your pet is covered with Frontline and Heartgard. If you have questions, just give our office a call. Lyme vaccination is important if you travel to areas of Wisconsin or other parts of the country where Lyme disease can occur.